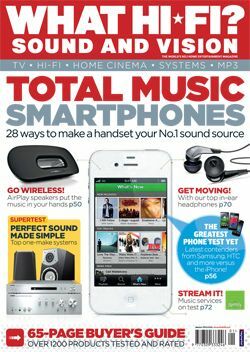 New issue on sale today: future hi-fi systems, headphones, TVs, smartphones and more | What Hi-Fi? The January issue of What Hi-Fi? Sound and Vision is on sale today, jam-packed with news and reviews on the latest and greatest kit. This month's Supertest sees the biggest names in hi-fi assembling complete '21st century hi-fi' separates systems for streaming, CD playback and computer music. The test includes a first look at a new Cyrus CD Transport, Cambridge Audio's latest budget amplifier, Naim's most affordable streamer, the ND5 XS, some PSB Image B5 speakers and plenty more. Elsewhere we have our first group test on AirPlay speakers – four speakers that allow you to stream music straight from your iTunes, iPhone, iPod Touch or iPad. On that subject we also have our biggest-ever smartphones test, with seven of the smartest handsets around – from Apple, HTC LG, Nokia, Samsung and Sony Ericsson – plus a first look at the new Samsung Galaxy Note. You'll need some decent headphones if you're using your smartphone for music, so we've tested eight sets of in-ear headphones from £50-£100, perfect for upgrading your mobile music experience. And there's more: we take a look at the top subscription music services around, review the best TVs around under £750 and devote five pages to some of the best high-end kit around in our Temptations section. Twelve pages of brand new products make-up our First Tests section, with NAD's Viso 1 iPod dock, Onkyo's TX-NR3009 home cinema amplifier a clever USB turbtable from TDK all featuring. This month's Insider section asks if this year will be the year of the tablets and whether Android has the beating of Apple at this new portable size, while last but not least there are your questions answered in Sound Advice and 65 pages and over 1200 products reviewed and rated in our Buyer's Guide. All this and more is packed into the January issue of What Hi-Fi? Sound and Vision, on sale now. And don't forget you can download the digital edition to your PC or tablet too.